Since the beginning of this Conference I have had a number of thoughts and I would like to add a few words along the line that was presented by Brother Richards this afternoon. Because strait is the gate, and narrow is the way, which leadeth unto life, and few there be that find it. (Matthew 7:13-14). Now destruction means, as I understand it, banishment, or to be shut out of the kingdom of God and have to dwell somewhere else. It is our opportunity in this dispensation, and our privilege and duty to spend our time in searching out our dead. We are of the house of Israel. We learn that through revelation, and that being true, then we reach the conclusion unless we have been adopted through the gospel and were gentiles, that our ancestors were also of the house of Israel. In other words, the promise made to Abraham that through the scattering of his seed all nations would be blessed, has been fulfilled, and our lineage has come down generation after generation through the loins of Abraham and the loins of Israel. Therefore our fathers are more likely to receive the gospel if they did not hear it in this life, to receive it in the spirit world than are those whose descendants are not in the Church, and who refused to received the gospel here. It seems to me this is a logical conclusion. That you may come up unto the crown prepared for you and be made rulers over many kingdoms, saith the Lord God, the Holy One of Zion, who hath established the foundations of Adam-ondi-Ahman; who hath appointed Michael your prince, and established his feet, and set him upon high, and given unto him the keys of salvation under the counsel and direction of the Holy One, who is without beginning of days or end of life. 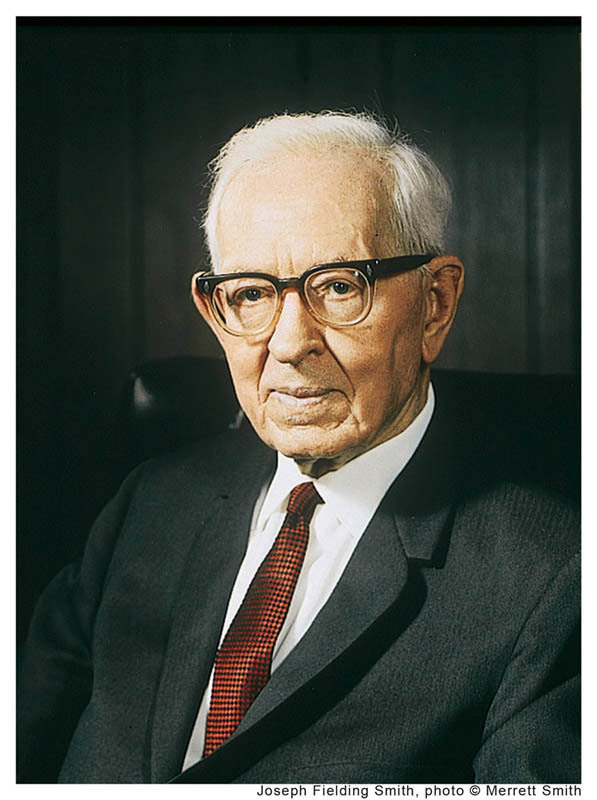 I think we ought to get that clearly in our minds because there are those who are trying to stir up trouble among the Latter-day Saints today by teaching doctrines that are not in accordance with the revelations of the Lord, and maintaining that Authorities of the Church who have gone before taught doctrines which they did not teach. So we must have it understood clearly that while Adam will preside over his posterity as Michael, the prince, and as he will hold the keys of salvation, as he does, all of that will be under the direction of Jesus Christ, the Holy One of Israel, for Christ is greater than Adam. We are taught in the gospel of Jesus Christ that the family organization will be, so far as celestial exaltation is concerned, one that is complete, an organization linked from father and mother, and children of one generation to the father and mother and children of the next generation, and thus expanding and spreading out down to the end of time. If we fail to do the work, therefore, in the temples for our dead, you see our links in this chain — genealogical chain — will be broken, we will have to stand aside at least until that is remedied. We could not be made perfect in this organization unless we are brought in by this selective or sealing power, and if we have failed to do the work for those of our line, who have gone before, we will stand aside until somebody comes along who will do it for us; and if we have had the opportunity and have failed to do it, then naturally we would be under condemnation, and I think all through eternity we would regret the fact that we had failed to do the thing that was placed before us to do and which was our duty to accomplish in the salvation of the children of men. Another thing that I would like to say: Some of us get so enthusiastic over this temple work that we are not willing to abide by the rules and the regulations, and to confine ourselves to our own line, but we want to spread out into the other fellow’s line, and we want to do the work because we readily find names that belong to somebody else, and that method of work for the dead is not permissible. It is all right to help others do their work, if we do that with proper consent, but each family group is entitled to do the work for their particular line. One more thought in regard to this work of salvation: A great many people are very anxious to do work for friends, and this thing has been carried to an extreme. We do not need to worry ourselves very much about friends. A man came to me a few days ago and presented two lists and said he wanted to do the work for these people because they were his friends. The oldest man of the group was born in 1710, and his children were born between 1730 and 1740, yet he called them his friends. Now we should confine our activities to our own line. If there is a good reason for doing the work for somebody who had befriended us, somebody who would have accepted the gospel but did not have the opportunity and who has no relatives in the Church that is a different matter, and we may be privileged to do the work, but we need not be over-anxious to work for those not of our own lineage whom we list as friends. The Lord has explained to us very clearly in the revelations what salvation means. He has pointed out in one of these revelations — section 76, which is known to us as The Vision — very clearly who shall enter the celestial kingdom. He has pointed out who shall enter the terrestrial kingdom, and who shall enter the telestial kingdom. These are three great kingdoms into which mankind will go; there will be some few exceptions. The sons of perdition are those who have had a knowledge of the truth, have known that Jesus Christ was the Son of God, have had the testimony of the Spirit of the Lord, the Holy Ghost, and these things have all been revealed so that they know they are true; and then they turn against them and fight them knowingly. Sons of Perdition are to be cast out with the devil and his angels into outer darkness. Into the telestial kingdom will go, according to that which is written here in this revelation, the vicious, the unclean, the ungodly. Last of all, these all are they who will not be gathered with the saints, to be caught up into the church of the Firstborn, and received into the cloud. These are they who are liars, and sorcerers, the adulterers, and whoremongers, and whosoever loves and makes a lie. The Lord says even of this class, the liars, and the unclean, they shall be judged according to their works, and every man shall receive according to his own works, his own dominion, in the mansions which are prepared; and they shall be servants of the Most High, but where God and Christ dwell they cannot come, worlds without end.” Of course the Lord is going to make them His servants in the world to which they go; in that telestial world they will become servants. They who enter into the terrestrial kingdom, the one higher than the telestial, are the honorable men — the honest, the virtuous, those who have been clean, and yet would not receive the gospel. There will be some others also who will go into that kingdom, but in a general sense these people will be the honest and honorable, who could not or would not see or receive the gospel of Jesus Christ, therefore they are assigned to the terrestrial kingdom. “…who have overcome by faith and are Sealed by the Holy Spirit of promise, which the Father sheds forth upon all those who are just and true. They are they who are the church of the Firstborn. What a wonderful thing it is to have the opportunity through the gospel of Jesus Christ of receiving all that the Father has, to become sons of God! Now they who enter into the terrestrial kingdom, and they who enter into the telestial kingdom will not be sons of God in the sense in which this term is used here. Of course we are all the children of God, every soul on the earth; we are His offspring, but in the great kingdom that shall be established in exaltation, all who receive exaltation will become sons of God, joint heirs with Jesus Christ and entitled to all the privileges and all the blessings of the Fathers kingdom. What a wonderful privilege that is! This blessing will not come to the inhabitants of the telestial and the terrestrial worlds. Now the question often arises, Is this earth upon which we dwell going to be one-third celestialized, one-third terrestialized, one-third telestialized? Are all the inhabitants of the earth going to dwell upon the earth? No. This earth is going to become a celestial body and is going to be a fit abode for celestial beings only; the others will have to go somewhere else, where they belong. This earth will be reserved for those who are entitled to exaltation, and they are the meek, spoken of by our Savior, who shall inherit the earth. When the Lord said the meek shall inherit the earth, He had reference to those who are willing to keep the commandments of the Lord in righteousness and thus receive exaltation. May the Lord bless us, I pray, in the name of Jesus Christ. Amen.